Wowza! What a busy week we have had! The wine racks have arrived and assembly has begun! This wine cellar design brings me to my fourth season of the One Room Challenge. So many other talented people are participating as guests, please check out their spaces too HERE. The One Room Challenge™ is a biannual event every April and October and is currently in its fourteenth season. Each round, twenty design bloggers take the challenge and transform a space. Every Wednesday, the designers document their process while sharing their sources and professional advice over six weekly posts. The ORC has also teamed up with the awesome Better Homes and Garden HERE! Who doesn’t love looking through those beautiful magazines for inspiration…I know I do! Just to bring you up to speed in case you are joining for the first time. We are building a wine cellar in the basement of our home. 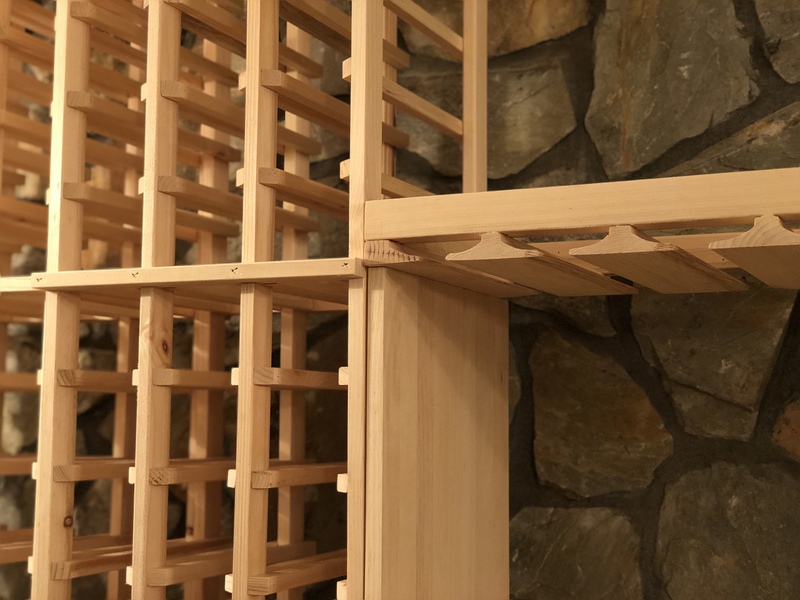 Being in the basement, creates an optimal space to store wine since it is cooler than the rest of the house, the cellar doesn’t have windows and the walls are covered in stone. Check out the prior week’s progress here. After working with 3 different wine cellar companies, we decided to choose Wine Cellar Innovations HERE to design and build our wine cellar. Wine Cellar innovations offered the best pricing and value for our project….and included free delivery. And what an interesting delivery it turned out to be. Deliveries at our house are usually interesting, the bigger the delivery the more interesting it is. We live on top of a hill with a long curvy driveway, not one that freight trucks have an easy time to navigate. The time we had a washer and dryer delivered to our home when we first moved in, the truck parked at the bottom of the driveway and the delivery guy pushed the washer and dryer up the driveway by hand. Another time, when we had gym equipment delivered, they unloaded 4,000 pounds of equipment and left it at the bottom of the driveway! I was so mad! Good old curbside delivery. But not Wine Cellar Innovations and FedEx! Our delivery guy was AMAZING!!! He braved the hill and drove up our driveway! The pallet of boxes is huge, our delivery guy could have dumped it all at the bottom of the driveway but did not. Uhhhh….one question though….how is that enormous pallet getting on the lift, the pallet is longer than the ramp. One by One!! Our guy worked so hard to carefully get us our delivery, he said “I’m in this with you and won’t leave until you have everything inside”. He was so nice, we called out the kids to help us carry all the boxes inside the garage. The boxes are carefully labeled so we know what is what and how the racks fit together. We have to help our awesome FedEx delivery guy navigate his way down our driveway… backwards! Assembly begins! My husband tells me, the process is very easy. Wine Cellar Innovations even supplied a nail gun free of charge! What a great UPS guy–kudos to him. Do you have to return the nail gun or is it yours to keep? Just curious! Also, I can’t wait to see next weeks post. I’m sure everything will turn out nicely. It’s my dream to have a wine cellar in a future home one day.